The 2018 season is upon us. The draw for the Pat O’Brien Cup took place at the meeting of the board and the competition is set to begin on April 26. There are 7 teams entered and the format will consist of 2 groups, one with 4 teams and one with 3. Group A includes Galway, Wolfe Tones, Connemara Gaels, and Donegal. Group B includes Cork, Aidan McAnespies and Shannon Blues. Teams will play each other once with the top team from each group meeting in the final. Two points will be awarded for a win and one for a draw, none for a loss. In the event of a tie total points scored will decide the winner. Games will be played on Field B. The final will be played on May 19. The Sheehan Cup for hurling will be played as a 7-a-side blitz on Sunday May 20. Teams and details to follow. 2017 Pat O’Brien Cup winners Aidan McAnespies traveled to New York last weekend for the annual seven-a-side and came within 3 points of taking the trophy to Boston. McAnespies came out of their group that included Kerry NY and St. Barnabas and met Barnabas in the final. Unfortunately for the Macs it was in the final that they conceded the first goal of the tournament, and it proved to be the difference between the teams in the end. 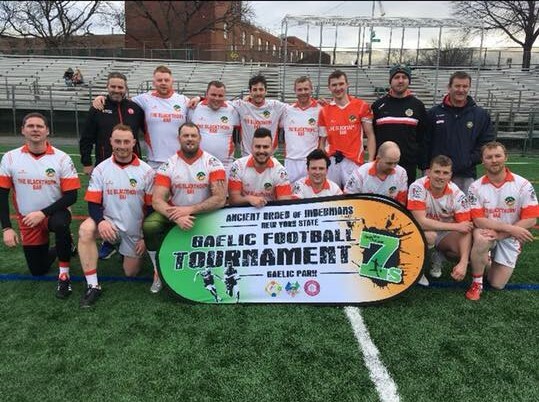 Players who traveled to New York were Seamie Breslin, Paul Clifford, Marty Bogue, Gareth O’Neill, Philip McCusker, Tommy Brereton, Robbie Croft, Craig Oliver, Ciaran Wallace, Che O’Donnell, Eoin Delmer, and Shane McKenna. On May 5 New York plays Leitrim in the first round of the 2018 Connacht Championship. 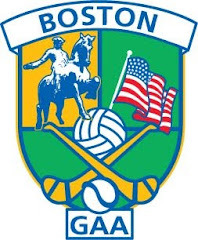 Two All- American teams, one hurling and one football, from the Boston-Northeast division will play New York development squad teams that weekend.